"It's shocking. They've brought the factory into politics." There's hardly a thrill for a film buff greater than to stumble onto a truly great film. 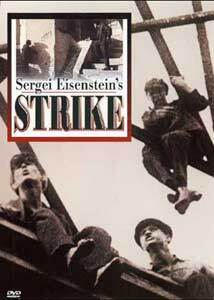 That is the feeling I had when I finished watching Sergei Eisenstein's first motion picture, Strike. Once one gets past the polemics, the film takes hold of the viewer and never lets go until the wrenching finale. Unlike Eisenstein's other masterpiece of 1925, Battleship Potemkin, this film is not based upon a real-life situation. Rather, Eisenstein and his compatriots, the Proletkult, are creating out of whole cloth events under czarist rule. They take no prisoners whatsoever; everything is directed toward sympathy with the plight of the workers, and no opportunity to blast the police and the capitalists is spared. The story is fairly straightforward; workers at a factory in an unnamed city in czarist Russia are discontented. However, it's not until management cruelly humiliates a worker, accusing him of stealing a micrometer and pushing him into suicide, that the pretext for a strike arises. And when the Russians strike, there's no namby-pamby picketing involved: windows are broken, foremen are dumped into muddy ditches and the goings-on are generally riotous. As the strike wears on, the workers begin to starve, but they refuse to give in to the terms of capital. The police conspire with the factory bosses to set up a ring of informers and spies, and hire agents provocateurs to cause trouble and to give the state an excuse to crush the strikers. While the leaders of the strike vainly attempt to encourage the workers to go home and stay out of trouble, the police first turn fire hoses on the strikers and then their rifles. Neither the plot nor the politics make this film great; it is Eisenstein's vision and technique which from the very outset is absolutely dazzling. He uses double exposure and juxtaposition to make ironic comments of all kinds; the montage technique which is so justly famous from Potemkin is used here on several occasions during the riots and the harrowing finale to brutal effect. As Eisenstein observed some years later, nothing affects the viewer like the spilling of blood. He inserts explicit footage of cattle being slaughtered amongst the many shots of the surging throng at the mercy of the police' guns. PETA members will not want to watch the end of this movie, which has a certain Faces of Death quality to it. The film is a veritable catalog of interesting shots. We start off with reflections of workers in a puddle, and then the film runs backwards. The mug shot of one of the strike leaders from front and side suddenly comes to life in a split-screen effect. The camera also heightens the paranoid aspect of the film, where everyone may be an informer. One of the spies in a James Bond moment uses a pocket watch camera to take photos of one of the strikers taking down a police poster. Eisenstein also dips into surrealism at one point; when the police are attempting to get one of the workers to act as an informer, a pair of midgets are dancing the tango on a dinner table behind them; when the two in the foreground leave, the midgets hungrily devour the food on the table. Eisenstein doesn't pull a single punch. When the police seize one of the strikers, suddenly we're seeing Rodney King all over again, as they punch and kick him into unconsciousness. The new musical score by the Alloy Orchestra takes a little while to get used to, but it forms a terrific counterpoint to the film. Heavily percussive during the factory sequences, the score is alternately slapstick and full of tension. The music has a vaguely Slavic character, with overtones of klezmer music, with intermittent clarinet and sax choirs. Image Transfer Review: The film is printed from the original negative. It is unfortunately damaged throughout, with speckles and spots; we have serious frame damage in about a dozen places. However, the picture we do have is gorgeous. Blacks are solid and there is a terrific range of greys. A beautiful transfer of problematic source materials. The B+ is an average score; parts are a definite A. For a film of this age, it's perfectly satisfactory. Two points are worth noting about the presentation. First is that the film is projected at 18 fps instead of the sound speed of 24 fps. This gives a much more natural feeling to the action, although it seems a little fast. The second is that the original Russian intertitles are preserved; when they come on, the screen is shrunk and windowboxed and the English translation appears below them. This is a first-class way to present a foreign silent film, and one which I heartily recommend to DVD producers. Audio Transfer Review: The new score sounds great overall. There is excellent stereo separation and sound reproduction. Range is good and no clipping or hiss was observed. A slight moment of static was observed in chapter 15, but otherwise there is nothing to complain about here. Extras Review: The sole extra is a full-length screen-specific commentary by a Russian film scholar. Although accented, he is easy to understand. While his interpretations can sometimes be a stretch (he seems to see circles everywhere; granted there are a lot of them but not everywhere he claims), overall the commentary significantly adds to appreciation of the text of the film. He also gives a fair amount of informational background on the making of Strike. Chaptering is adequate, but that's about it. An excellent (though highly politicized) motion picture. Anyone with an interest in silent film or in bravura directing technique will want to own and study this picture closely. While restoration is in order, the transfer of the source material is beautiful, and the score is a great companion. Very highly recommended.